I love that Jesus used parables to teach us because I love how easy it makes it to identify with the lesson He wanted us to learn. Stories are so much better than just straight teaching, don't you think? Take the parable of the vineyard workers, for example. It can be found in Matthew 20, but here is the condensed version: A vineyard owner goes out looking for workers first thing in the morning and hires some, saying he'll pay them the going rate for a day's work. A few hours later, he goes out and hires a few more, saying that at the end of the day he'll pay them whatever is right. Twice more through the day he goes out, hires a few workers and says he'll pay them whatever is right. The end of the day comes and the owner tells his foreman to pay the workers, starting with those hired last. Those workers get the going rate for a full day's work, which makes those who were hired first assume they will get more. When their turn comes, though, they are also paid the going rate for a day. Feeling cheated, they protest that they worked longer than those who were hired later and so deserve more. The owner says to them, "Friend, I haven’t been unfair! Didn’t you agree to work all day for the usual wage? Take your money and go. I wanted to pay this last worker the same as you. Is it against the law for me to do what I want with my money? Should you be jealous because I am kind to others?" (Matthew 20:13-15). Jesus was telling us that those who serve God all their lives and those who give their lives to Him at 90 are all going to get the same reward. Don't you love that generosity? Just think of the thief on the other cross as Jesus was being crucified. He acknowledged that Jesus was innocent and asked Jesus to remember him when He came into His kingdom, to which Jesus replied, "I assure you, today you will be with me in paradise” (Luke 23:43). It can't get much more last minute than that. He was a man who, by his own admission, deserved to die for the crimes he had committed, and yet when he acknowledged Jesus as King, Jesus immediately conferred on him the right to eternal life. That man would never live a single day as a Christian, never tell anyone about how Jesus can save people from their sins, never show by his radically changed life the power of God. And yet Jesus promised him eternal life in paradise. Do you know why? Because what we do for God has nothing to do with our salvation. "For it is by grace you have been saved, through faith—and this is not from yourselves, it is the gift of God— not by works, so that no one can boast" (Ephesians 2:8,9). It wasn't our work that brought us salvation to begin with. It is entirely through faith in the work Jesus did for us, which means that how long we have believed or how much we have done in service to God is completely irrelevant. All that matters is that we believe. 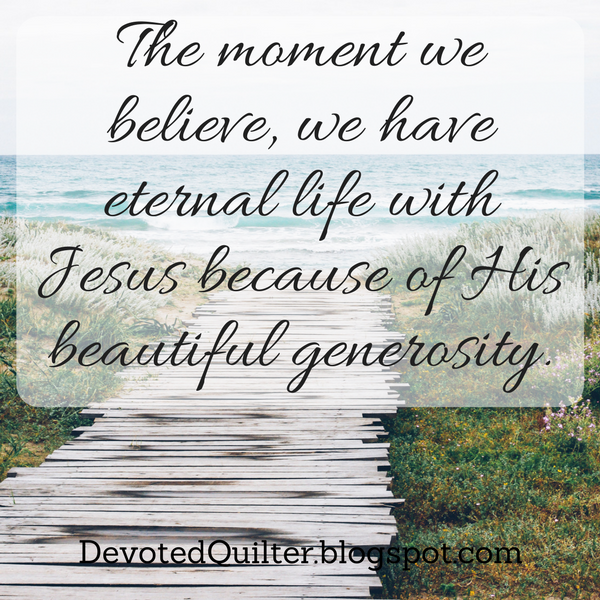 The moment we believe, we have eternal life with Jesus thanks to His beautiful generosity.